Palmer Freeman Luckey is an American inventor and entrepreneur. He is the founder of Oculus VR and inventor of the Oculus Rift, a HD VR head-mounted display that provides the user with different virtual realities. Luckey ranks #26 on Forbes' 2015 list of America's richest entrepreneurs under 40. Luckey was born and raised in Long Beach, California,and grew up with three younger sisters,a mother, and a father who worked at a car dealership.As a child he was homeschooled by his mother, took sailing lessons,and had an interest in electronics.He took community college courses at Golden West College and Long Beach City Collegebeginning at the age of 14 or 15, and started at California State University, Long Beachin 2010 as a journalism major.He also wrote and served as the online editor for one of the university's student-run newspapers, Daily 49er. From ages 11 to 16, he experimented with a variety of high-voltage electronics projects including coil guns, Tesla coils, and lasers.He built a PC costing tens of thousands of U.S. dollarswith an elaborate six-monitor setup.He had an intense interest in virtual reality (VR), and built an extensive private collection of over 50 different head-mounted displays, often purchased at auction for a fraction of their original cost.Headsets in his collection include the Vuzix iWear VR920, eMagin Z800 3DVisor,Fakespace Push, Liquid Image Corporation MRG2, Visionics LVES, and a heavily modified Sony HMZ-T1. To fund these projects, he earned at least US$36,000 by fixing and reselling damaged iPhones,and was also a sailing coach and did boat repair. In 2009, he founded ModRetro Forums, a website for discussing modifications to old hardware devices such as game consoles and PCs. During his study at California State, he worked as a part-time engineer at the Mixed Reality Lab (MxR)at the Institute for Creative Technologies (ICT) at the University of Southern California as part of a design team for cost-effective virtual reality. Luckey was frustrated with the inadequacy of the existing head-mounted displays in his collection for gaming due to low contrast, high latency, and low field-of-view. In response, he created his first prototype at age 18 in his parents’ garage in 2011,called CR1 and featuring a 90-degree field of view. Palmer developed a series of prototypes exploring features like 3D stereoscopy, wireless, and extreme 270-degree field-of-view, while also decreasing size and weight. He posted regular updates on his work on MTBS3D, a forum website frequented by virtual reality enthusiasts.His 6th-generation unit was named the "Rift," and was intended to be sold as a do-it-yourself kit on the Kickstarter crowdfunding website to fellow enthusiastsrather than a pre-assembled consumer device, with a target of about 100 customers.He first started Oculus VR in order to facilitate the Kickstarter campaign. John Carmack of id Software, a notable game developer and regular at MTBS3D, requested one of the prototype headsets, made improvements to it, and demoed a modified version of id Software's Doom 3 BFG Edition on the device at the Electronic Entertainment Expo 2012. With the resulting attention of thousands of people suddenly drawn to the Rift, Luckey dropped out of university to focus on it. He showed an early prototype to Brendan Iribe, a former executive of Gaikai and Scaleform, who described it as "dangling wires and circuit boards and duct tape and hot glue all over the place" and invested "a few hundred thousand" U.S. dollars in the Rift's Kickstarter campaign.Iribe joined as Oculus VR's CEO, and Michael Antonov (former CTO of Scaleform) joined as chief software architect. Luckey also demoed the unit to Valve, and received Kickstarter endorsements from Valve's managing director Gabe Newell and prominent veteran Michael Abrash (now Chief Scientist at Oculus VR). During the Kickstarter campaign, Luckey demoed the Rift at QuakeCon 2012. The Kickstarter campaign was successful, raising US$2.4 million or 974% of its original target.As a result, Oculus VR targeted a larger scale of units and expanded with more employees and an office space, but Luckey described his day-to-day process as not having "changed all that much," remaining a "slow plod towards making this thing a reality. "Oculus VR was acquired by Facebook in March 2014 for US$2 billion, and although his share is not public, Forbes magazine estimated the founder's net worth to be $700 million in 2015.Today, he continues to work at Oculus VR on core VR technology. Luckey has become "the face of virtual reality in gaming"and a celebrity among virtual reality enthusiasts; however, he doesn't consider himself to be a celebrity.He has a casual appearance: he is frequently barefoot, and prefers sandals to shoes even at trade shows and events.He has been described as "polite" and "upbeat"with "omnivorous curiosity." 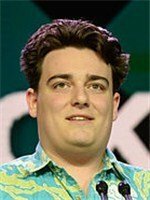 Despite his newfound wealth, Luckey lives in a shared house with several others where they regularly play multiplayer videogames, and he typically wears casual clothes like shorts, T-shirts, Hawaiian shirts and sandals.